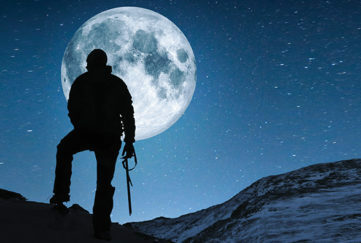 The day after the winter solstice on the farthest north Munro for the 13th and final full moon of 2019. This is known as the Cold Moon, appropriate for the time of year. The chances of a perfect night were slim. I would happily have settled for making it to the summit and down again in anything less than horrendous conditions. In the end, however, Hope prevailed. We made our way up in a disappointing drizzle, cloud blocking out the stars and the route ahead. The moon was nowhere to be seen. But as we started the push up the final rise, we caught a faint glow in the sky. At last. 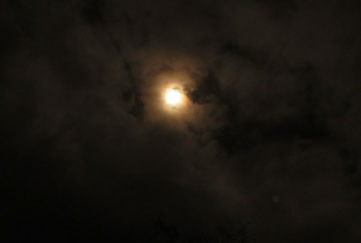 This was the Cold Moon, trying to push its way through the clouds. We stood for five minutes, scared to move off in case the moon would emerge triumphant for a few seconds and we would miss it. Our vigil paid off. One mighty thrust and it was there, rings of rainbow halos pulsating. 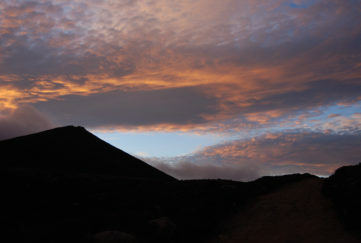 It stood its ground, resolute for the next half hour, accompanying us up the ridge, until cloud swept in to smother the light again. 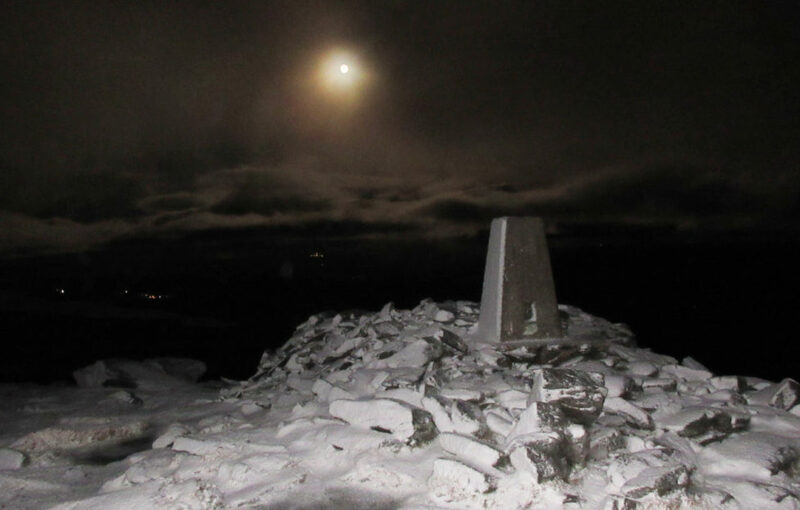 We continued along the ever flattening terrain leaving imprints in the freshly fallen snow until the faint outline of the summit trig point could be seen dead ahead. Fifty steps to the finish … 40 … 30 … 20 … and then the unexpected twist in the tale as the clouds parted and the Cold Moon exploded back on to the scene. 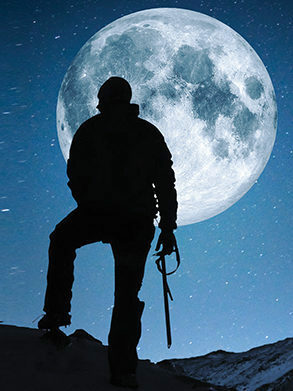 From zero visibility we now had 360-degree vision, the distant lights of remote buildings twinkling far below, the outlines of surrounding ridges and rock formations standing out. The lunar light cast on the string of lochans dropping down through the blackness in stages looked like golden teardrops, as if the moon itself were weeping with joy. 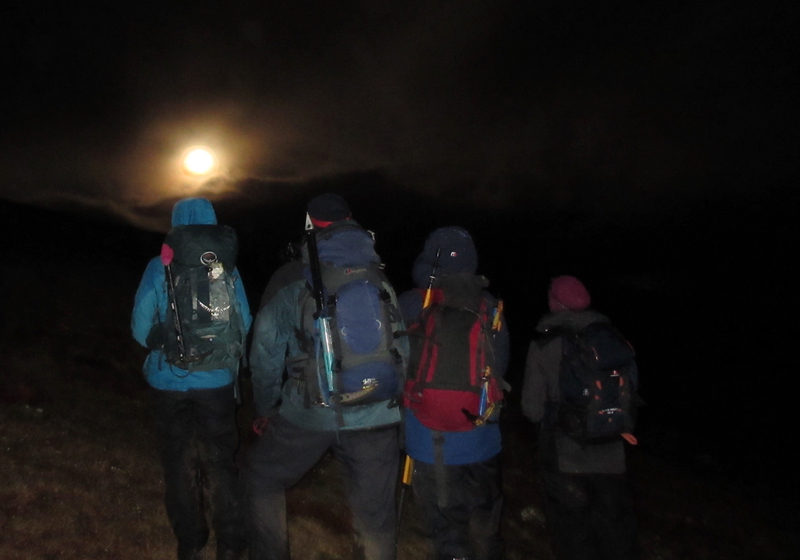 Alan and company marvel at the sudden emergence of the full Cold Moon. blogs so far here and on his website. 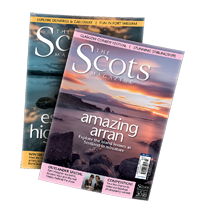 in The Scots Magazine‘s March issue!